Wondering how to keep your garage door working nicely for years to come? Then you need these garage door maintenance tips. It’s all too easy to forget about garage door maintenance until something goes wrong. Then, you’ll find yourself paying extra for repairs and wondering why you didn’t catch the problems before they became expensive. Un-maintained garage doors can even be dangerous. Luckily, garage door maintenance is easy and can save you a lot of money in the long run. Use this guide to walk you through keeping your garage doors working well for years to come. Keep reading to get started! To get started, you should review your garage doors and tune up any parts that need work. If they get worn out and aren’t properly maintained, your garage doors might start to stick, lock up, or even fall on someone. Follow these steps as you go through the rest of the guide, so you’ll stay safe. Now, let’s go over what you’ll need to do to keep those doors properly maintained. The first step in garage door maintenance should always be a visual inspection of the door and its hardware. If there’s any major damage to the door, you’ll be able to see it right away. You should call a professional for this kind of damage, such as when your door gets hit by a car. After you’ve visually checked the door, look at the fasteners, hinges, tracks, springs, roller wheels, and cables to see if any of them are rusty or broken. If you see a lot of damage or rust to these parts, you can replace them, as long as you’re comfortable with doing the repairs. However, if you’re not confident with these repairs or you don’t have the right equipment, you may want to call a professional. 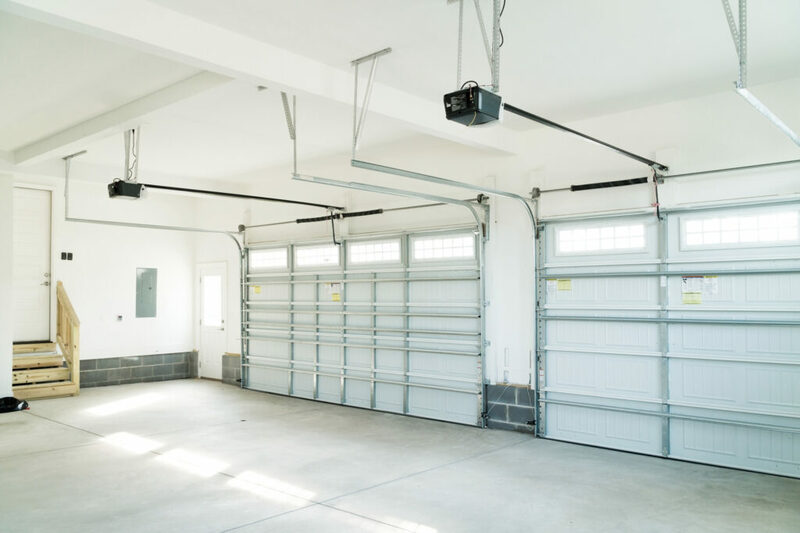 As your garage door opens and closes over and over again, the nuts and bolts on the roller tracks and brackets will naturally shift around and become looser. Make sure to tighten the roller brackets and the bolts that connect those brackets to the rail. This is a garage door maintenance step that you should do once a month. A lot of garage doors have nylon rollers that will start to break down over time. Inspect the rollers for cracks and chips, if they’re nylon. If the door has steel rollers, check the bearings and see if the wheel is starting to tilt, since this can cause damage and uneven wear. You can usually find replacements for these parts at your local hardware store, and they should come with instructions that are easy to follow. A word of caution: don’t remove the bottom roller bracket while you’re doing repairs. It has a high-tension cable attached, which can snap and injure you. The lift cable on the bottom roller brackets will start to wear out with time, especially where it’s cold. The bottom part gets the most moisture exposure, so check that area first. Use an old toothbrush or other brush to take off any built up dirt and debris. If the cable underneath is frayed or otherwise worn, call a professional to do the repair, since this part has a lot of tension. Next, look at the tracks of the garage door to see if they have cracks, bends, or other visible wear and tear. If an area looks pinched or worn out, it’s best to call a professional. Otherwise, this damage could make the door fall or get stuck, which is dangerous. If the track looks fine, use a level to do one final check. Place the level against the track, and make sure it’s level, by looking at the middle and top bubbles. If it’s not, unscrew the support bracket just a tiny bit so you can move the track until it’s level. An un-lubricated garage door can make unpleasant sounds, and it also can turn into a major maintenance issue. You’ll need to have a lubricant like white lithium grease on hand. Find the opener chain or screw, and spray it with a lubricant to keep things running smoothly. You should do this at least once every year. You’ll also need to clean the extension springs and overhead torsion springs. Spray them with a cleaner or lubricant twice a year, at least. After you spray them, you don’t need to wipe off the excess — it will actually keep your springs working longer. Lubrication keeps your door from sticking or dropping, so don’t skip this important garage door maintenance step. Keeping out moisture is an important part of preventative maintenance, especially in some parts of the country. Check the weather seal on the bottom of the door each year to make sure it’s holding up well. If the weather seal develops permanent gaps or other signs of damage, it’s time to replace it. This not only keeps your door working right but also keeps the things in your garage safe. Garage door maintenance is important for several reasons. It helps protect the things in your garage, and can minimize the cost of repairs. But most importantly, it helps keep you and your family safe. Need a professional for the repairs you can’t DIY? Contact us today – we can help.